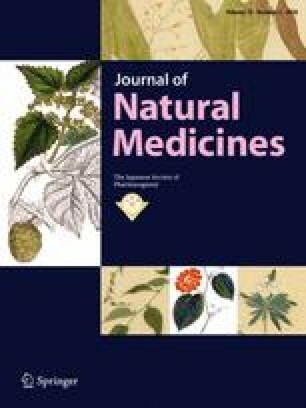 Discovery of agents for oral infectious diseases is always encouraged in natural products chemistry. A bioassay-guided isolation led to the isolation of two new acetylenic acids (1, 2) along with seven known ones (3–9) from the ethanol extract of Thesium chinense Turcz, a commonly used oral anti-bacterial and anti-inflammatory herb. Their structures were elucidated on the basis of spectroscopic and chemical evidence. Exocarpic acid (3) demonstrated the most promising activity against three tested oral pathogenic bacterial strains, Porphyromonas gingivalis, Fusobacterium nucleatum, and Streptococcus mutans, with minimum inhibitory concentration values of 0.86, 3.43, and 13.70 μg/mL, respectively. Compounds 1, 2, 4, 5 and 7 also showed potential activities against periodontal bacteria (P. gingivalis, F. nucleatum). Chang Liu and Xiao-Tian Li have contributed equally to this work and should be considered co-first authors. This work was financially supported by the Shanghai Science and Technology Development Foundation (17XD1403500).